This post was sponsored by R.Riveter. As always, all opinions are my own. Guys, I have a really special post today. 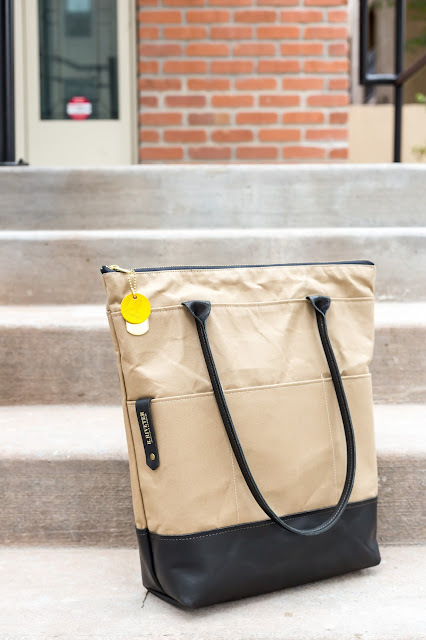 I know you are going to be swept away by the pictures of these beautiful R.Riveter bags, but read on, because what's even more beautiful than these bags, is what they represent. If you are a Shark Tank fan, you may have already seen these bags, but let's start from the beginning. The mission behind R.Riveter is simple - to employ, engage and inspire military spouses. Being that I live in a VERY military town, I immediately had an appreciation for the mission. What I was completely blown away by, was how incredible these bags are! As they state themselves, "R.Riveter exists to provide flexible, mobile, income for military spouses." Think about that for a second...can you even imagine how difficult it must be for a military spouse to be constantly traveling for location to location, always in search of a new job? It's honesty something I hadn't really contemplated before. That's where R.Riveter comes in. The parts for each bag are made across the country by military spouses, then sent to their "Fabshop" for production. Each bag comes equipped with hand stitched liners, and hand cut leather, which are hand crafted by military spouses across the nation. (How's that for American made?) They even use upcycled retired uniforms, canvas tents and blankets. I was completely shocked at how high quality these bags are. The vegetable tanned leather is such good quality, the canvas is sturdy and the liners are the cutest fabrics! 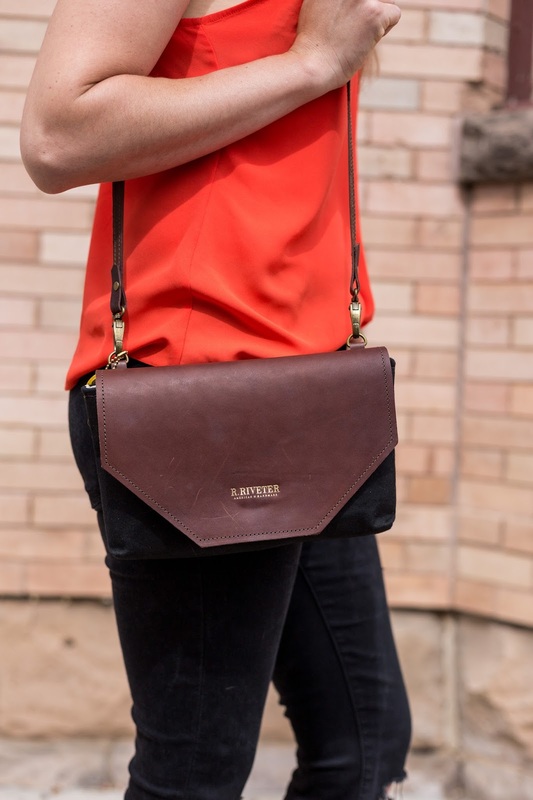 There are different stages of bags, so if you want one with up cycled materials check out their Limited Collection, but if you want to get your hands on some of the highest quality leather on the market, check out their Signature collection. They even make a number of accessories, which you can find here. I especially love that each bag comes with its own stamp, associated to the Riveter who made it. You can even get to know more about the specific maker here. Such cute bags! And love the message behind them! i love the style and the message!! how did i miss these on shark tank!? I love those bags and what they stand for! Great post! Love watching Shark Tank with the bf! One of our favorites! Ok, I LOOOOVE this! I myself am a Marine wife so this initiative is amazing! I hadn't heard about this before but totally looking into these bags now! So cute too! Such a great cause to shop for! Love the bag! Very cool bags! Love a good Shark Tank story!! What a wonderful cause, and such cute bags!! What a great message behind these bags, I remember seeing them on the show! I remember seeing these on Shark Tank! So fun. 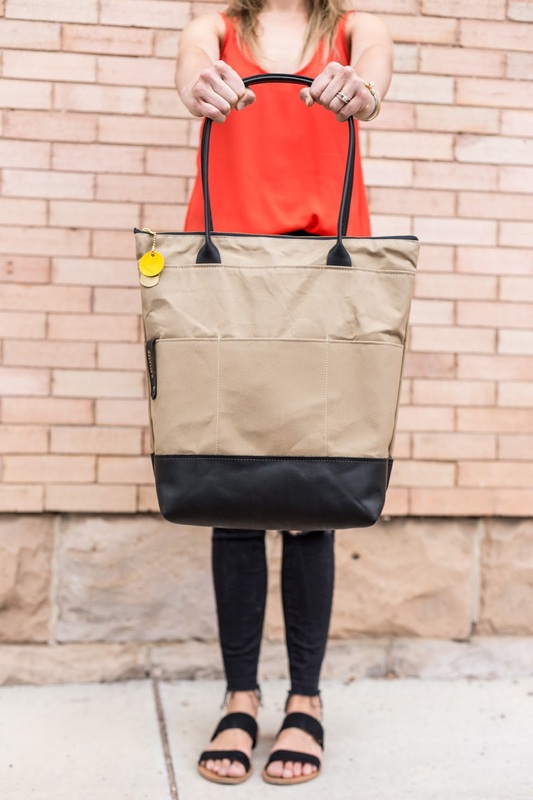 I love the tote! That tote looks so functional! Love that top! This is the cutest tote! I love the two colors and that orange top is perfect! These bags are so cute and I love the message behind it!